Sending you into stunning, contemporary comfort is the amazing Valhalla Chalk Collection, an Outdoor Wicker range that is as fantastic in quality as it is luxurious. A beautiful 2 piece collection that gives many options so that you can uplift any space, the Valhalla Outdoor Wicker garden range is an incredible blend of traditional design with modern sensibilities. Featuring in this divine suite is the fabulous Valhalla Outdoor Sofa, and amazing, cushy Club Chair, two absolutely gorgeous products that are fantastic on their own or as part of a larger setting. 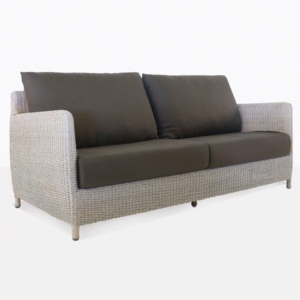 Situate your Valhalla Outdoor Sofa in the midst of your garden, with a lush pot plant on either side. Pop two Valhalla Club Chairs opposite, and get set to enjoy an amazing deep seating unit that puts you and your guests into a feeling of luxury, charm and comfort. The Valhalla Collection is made from top of the range outdoor materials. Beginning with the robust frame that holds together the shape of this terrific suite. Made from powder coated aluminium, which is durable for outdoor weather. Our all weather wicker is a through dyed and UV treated polypropylene which looks incredible, and continues to year after year! Finally, free Sunbrella® cushions filled with QuickDry® foam included with your purchase. All these products give you a quality assurance on your outdoor furniture. Enjoy as you sink into utter opulence with the Valhalla Outdoor Wicker Range. Valhalla Chalk is just one of many deep seating sets available from Design Warehouse! You might like to check out our teak and concrete options as well as many other wicker designs. To order Valhalla, call now! Our sales assistants are ready to help you transport your space into a slice of tranquility.